Improvisations and exercises for developing acting skills. 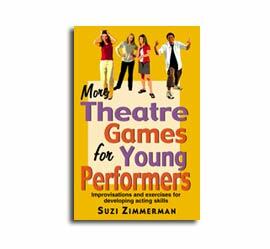 By popular demand, we offer a follow-up book of theatre games specifically for young acting students. Written especially for those who coach adolescent actors, this delightfully fresh updated workbook tells you the how, when, what, and why of theatre games for young performers. Starter scenes allow first-time performers to ease onto the stage in baby steps. Spontaneity is encouraged along with etiquette and basic acting principles. The concepts of pantomime, improvisation, character development, voice, and body control are all presented in game formats with exercises. Nine chapters include: Before You Begin, Preparing, Starter Scenes, Exercises, Games, Improvisation, Pantomime, Non-Acting Theatre Games and Activities, and Developing Your Program, plus an Activities Index. Anyone working with young actors will find this theatre book exceptionally helpful. A 36-week action handbook for middle grade and high school students and teachers. For all ages. Student Handbook: At last! -- A student-friendly, teacher-friendly workbook with study units for an entire year of classroom drama activities. The entire spectrum of theatre is covered in ten sections: 1. Getting Started, 2. Evaluation, 3. Scene Work, 4. Acting, 5. Characterization, 6. Publicity and Other Production Business, 7. Play Production, 8. Theatre History, 9. Games and Improvisation, 10. Planning for the Future. 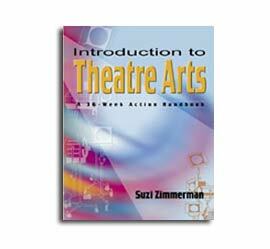 All units in this theatre text are complete with detailed instructions, examples, working forms, and photo illustrations. Theory combined with hands-on is the style of every chapter. Every student will learn all the basics of theatre history, play production, performing, and how to find a career in theatre. This instructional program has been classroom-tested and updated to fit the budgetary considerations of all schools. A 36-week action handbook for middle grade and high school students and teachers. Teacher's Guide: This matching companion guide to the student's action workbook makes teaching this class easy and fun. It includes the answers to all questions. It provides lesson plans, a weekly calendar, a survival guide for a substitute, poster ideas, evaluation forms, hand-outs, planning materials for fundraising events, and awards. More teaching-assists than you'll ever need. An action handbook for middle grade and high school students and teachers. For all ages. 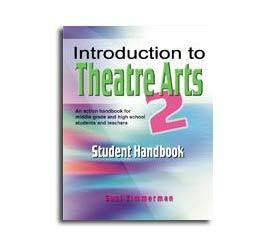 This Student Handbook is a sequel edition to Introduction to Theatre Arts. More study units for an entire year of classroom drama activities. Includes seven sections: 1. Theatre for Life's Lessons, 2. Movement -- Theatre for the Eyes, 3. Voice -- Theatre for the Ears, 4. Skill-Building Activities -- Theatre Projects, Mini-Units, and Self-Guided Lessons, 5. Understanding and Writing Scripts, 6. Theatre Behind the Scenes, 7. Production 101. Theory combined with hands-on is the style of every chapter in this theatre text. Classroom tested to fit the budgetary considerations of all schools. Teacher's Guide: This matching companion guide to the Student Handbook makes teaching this theatre class easy and fun. In addition to extra sample scripts and scoring rubrics, it includes four chapters with activities and tips for teaching theatre for unique learners and students who are learning a new language. This guide contains more teaching assists than you’ll ever need.